weight: 28 g bodylength: 50 mm JyadouBrade (size): 2 * The image of the product being posted is displaying the representative image. Moreover， the color may look different from the real one. Please be forewarned. Synergy with bottom trace & long wire. Kurukurafasutoakku improved distance and settling speed than traditional kurukuru， it is difficult to rise， bottom trace became easier. The swim posture maintains a minorike posture. Following the long wires that feed around without letting the target make blade bytes. 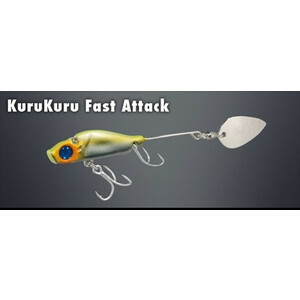 It is (KuruKuru) that uses the principle of inviting a blade with a body (spinnerbait). You should be able to experience the original meaning of the blade lure by using the first attack and using the counterattack with a model equipped with the levitation theory.